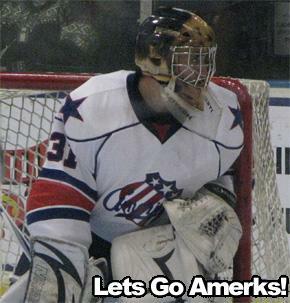 Amerks Tie Team Record For Losing Streak · Let's Go Amerks! Â The Amerks 2-1Â loss to the Toronto Marlies on Wednesday night tied a team record with the ’81 and ’88 teams for a ten game losing streak.Â The loss also puts the team in a three way tie for last place in the league.Â The team has a must win game against the Bulldogs to avoid being sole owners for longest losing streak by an Amerks team in 52 years. As for the game itself, David Brine scored the first goal of the game with 3:05 left in the first period getting his own rebound and scoring on Marlies goaltender Justin Pogge. The lead didn’t last for long as the Marlies tied the game a minute and 55 seconds later when John Mitchell scored on a one timer past Tyler Plante. As quickly as the second period started the Marlies scored the game winning goal when Kris Newbury scored his 11th of the season. The Amerks had nearly 39 minutes to tie the game but failed to do so even with eight power play opportunities and out shooting the Marlies 23-20. The game also featured a total of 52 penalty minutes,Â a decent fight between Pat Kaleta and Colin Murphy, and as always an impressive ice cream eating contest! A one goal game does show that the game was close, but in the endÂ a loss is a loss. This Amerks team is heading down the road of being one of the worst ever which raises a lot of questions with few answers. Tyler Plante started his third straight start and third loss. Where is the offense?Â Fans are saying a big issue this season has been goaltending, but without offense you can’t win games. Are all of the team’s front office off ice issuesÂ impacting play? Is it the lack of veteran leadership to help through tough times like this? Is it the coaching?Â Cunneyworth has been a great coach, but is his lack of job security for next year keeping him from being at his best? Or is it the players not being able to execute?Â A lack of chemistry? Or do they justÂ not care any more based on all of the above? Why are players still saying “we played well,” in post game interviews? You lost, you didn’t play well enough! A loss on Friday night against the Hamilton Bulldogs will put them in the record books, more than likely put them as sole owners of last place in the league, and create a bigger lack of interest in the casual fan from wanting to go to games. What do you think about what’s going on?Â Let us know!